The available data on country attributes is permanently growing and their access is getting more and more comfortable, e.g. in the case of a direct API for (nearly) all the world bank data. Many of those characteristics are genuin network relations between countries (like trade flows), thus, in the sense of Social Network Analysis (SNA) edges between nodes. However, it is still a challenge to visualize those international relationships, though there exist many programs that cope with that issue (e.g. Gephi). Nevertheless, I would like to illustrate in this brief note the specific possibilities of combining the Networkx and Basemap package in Python, since it provides a “whole-in-one” solution, from creating network graphs over calculating various measures to neat visualizations. The matplotlib basemap toolkit is a library for plotting data on maps; Networkx is a comprehensive package for studying complex networks. Obviously, the relations between nations can be best represented if their network locations are equal to their real world geographic locations, to support the readers intuition about borders, allies and distances. That´s precisely the point here, additional enhancemenents will follow (e.g. how to calculate and visualize certain measures). After you imported both packages (together with matplotlib) in your Python environment, we are ready to go. First of all, we need to set up a world map style that will serve as background, but there are also many regional maps available, depending on what you want to show. 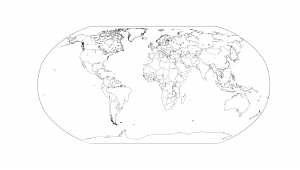 In this case, I chose the classical “Robinson Projection” (the other two arguments define the center of the map and the graphical resolution). After the set up we can now ‘draw’ on the map, e.g. borders, continents and coastlines, like in geography lessons. 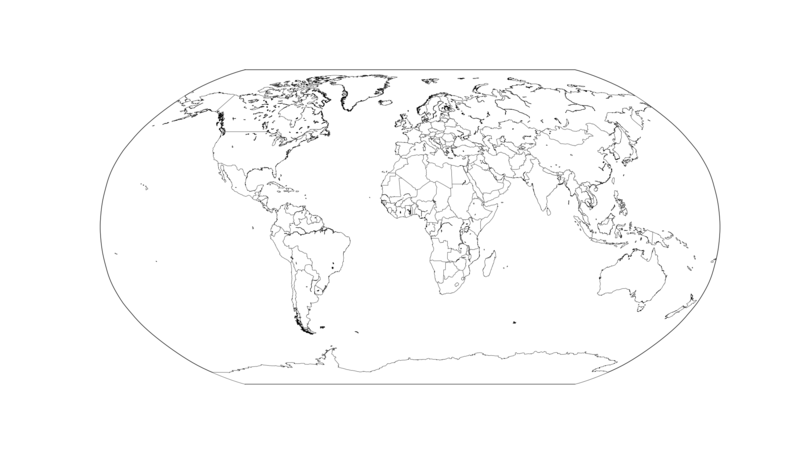 To be sure, you can change the color and width of the lines, continents, seas and rivers with the subsequent arguments in each function. Letting rivers and lakes disappear is a bit more tricky, cf this issue stackoverflow. Almost done. The last step is to define your network attributes you like to visualize in your graph. 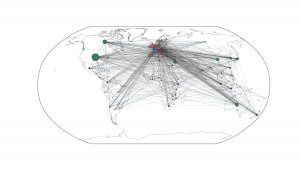 In our case, the connections between the countries represent international scientific collaboration in Economics and their subsequent communities (variable ‘part’) according to the modularity algorithm. You see the effect of the different arguments in the draw_networkx_nodes/edges command in terms of node color, size or shape. That´s where you modify your graph. In our example you realize at a glance that there a historically and politically rooted collaboration preferences in the economic field, with a bipolar Europe, a rather peripher community of Third World countries and a dominating global group arranged around the US. Due to the basemap background and the geographic coordinates of the nodes, this relationships are immediately and intuitively apparent.